Coppell TV Repair LLC offers you a set of replacement electrolytic capcitors commonly failing on power supply board AEP016-37 / EEC-PWAEP01G000. 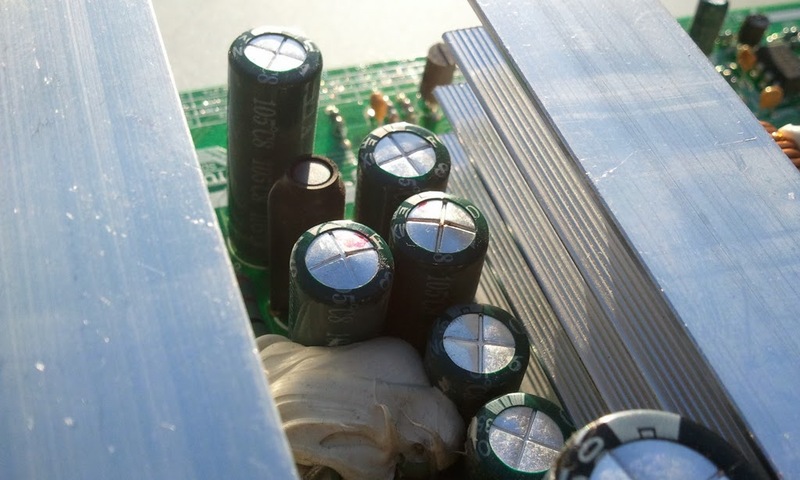 As with many other power supply boards those are the output filter capacitors for the main board and inverter boards. When going bad, electrolytic capacitors often tend to bulge their tops or bottoms - and are an easy catch even with a naked eye. On the other hand, they do not necessarily go bad at once and it is possible for them to be bulging and still be operational for quite some time - depends on the particular capacitor and circuit it is in. Which is to say that bulging capacitors, while a clear indication of a need for change, are not necessarily the source of malfunctioning of a TV. The kit comes in two versions - standard and plus. The standard version contains the capacitors that we have seen going bad as per the above article and a few more that MAY go bad based on past experience - pretty much the major electrolytic filter caps on the board except the mains. Specifically. the capacitors included are: C26,C27,C42,C43,C62,C65,C66. The plus version also includes the mains filter capacitor C10. We strongly encourage you to look at the capacitors on your board before ordering. If a capacitor on your board needs to be replaced and it's not in either of our offerings please do not hesitate to contact us prior to ordering!